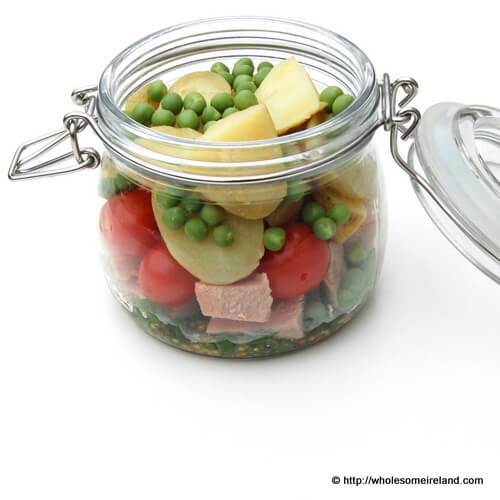 It’s National Potato Day on Saturday 25th August, here’s a quick potatoes in a jar recipe to celebrate that uses leftovers. It’s perfect for kid and adult lunchboxes alike. 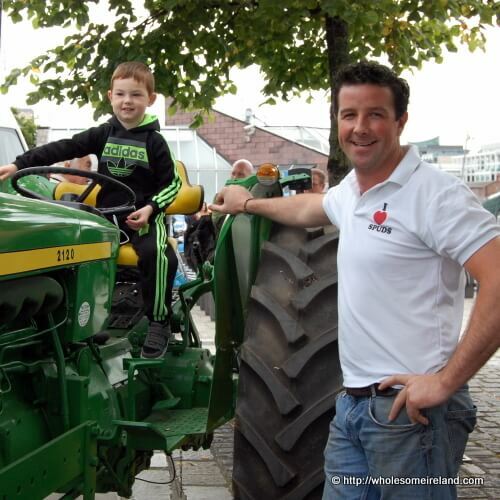 There’s also a chance to win a hamper of goodies from Keogh’s Farm! Keogh’s Farm and I have a love, love relationship. They love to grow potatoes, handmake crisps from those spuds and are all around nice guys to deal with. 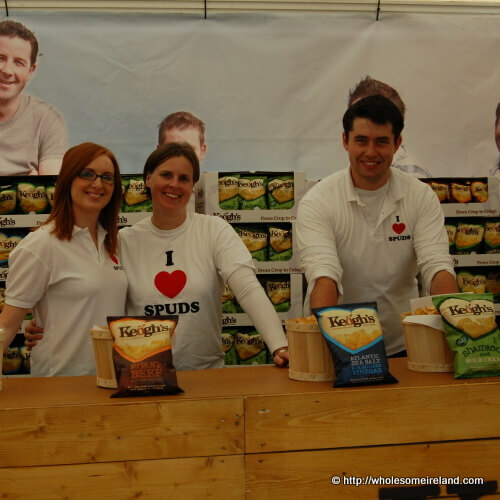 I love to eat their potatoes, have done for decades, their crisps are a new venture and they are mighty fine. It’s an added bonus that they are local to me so by eating their potatoes and crisps I’m supporting a local farm, jobs and enterprise. Do I need another excuse to eat their produce? Early this morning we went on “an adventure” as the 3 year old puts it and took the train into Dublin City Centre to see the tall ships. I love everything to do with the sea and sailing but the tall ships make me want to sail into the sunset with the wind in my hair and the sails billowing in the breeze. It was an awesome sight to see the huge ships come into harbour this morning with sailors standing on the masts and in the rigging singing their hearts out. Enough of my romanticism! The 3 year old didn’t appreciate the ships as much as he did the Keogh’s Pop-Up Farm down near the Dublin Bike stand on the North Quays. There was a tractor parked up on the path outside it. Not just any tractor either, but a vintage John Deere. This is as exciting as it gets when you’re 3 and tractor mad. He went quiet. Then when Tom Keogh (thank you so much if you’re reading by the way) lifted him up so I could get a picture of him “driving” the tractor he nearly burst with joy. If you are in at the Tall Ships Festival in Dublin City Centre over the next few days please do drop by and say hello, then sign the Potato Petition if you haven’t already. 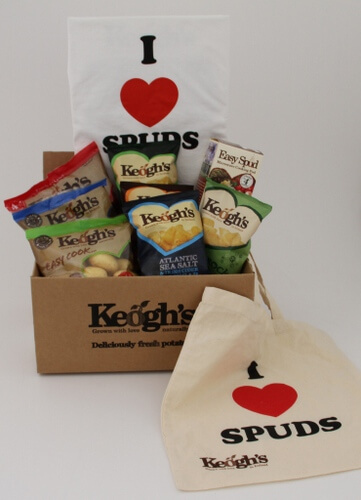 To celebrate National Potato Day Keogh’s Farm have been generous enough to give me a hamper of spud-related goodies for you, my readers. See the picture below. It’s pretty fabulous. In order to win the hamper tell me what your favourite way of eating potatoes is in the comment box below & please note you must be resident in the Republic of Ireland. The winner will be chosen by random selection and you have until Monday the 3rd September to enter. Before you do that can you please sign the Potato Petition if you haven’t already? 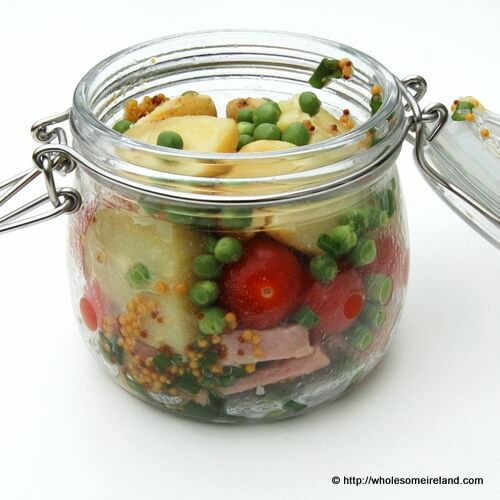 In the meantime here is a lunchbox friendly salad which is actually made from a leftover ham dinner. The key is to put the dressing in the bottom of the box or jar before filling it and to layer it with the meat at the bottom, then the vegetables on top. There is no need to add seasoning as the ham should be salty enough. Don’t shake the box until just before serving (so keep upright in transit) and it is just as nice warm as it is cold! Measure the mustard, oil and cider vinegar into the bottom of the lunchbox or jar then stir with a teaspoon. Chop the chives finely and add to the dressing in the bottom of the lunchbox. Chop the meat into bitesize chunks and put down as the next layer. Add the cherry tomatoes and freshly podded peas (although frozen is fine too). There is no need to cut the tomatoes at all they will stay fresher if they are whole. Cut the potatoes roughly and layer on top. Seal the box until ready to serve you can easily prepare this meal from the night before. It will keep for 2 days in the fridge providing your ingredients are fresh. Please note: This blogpost is not sponsored. My opinions are my own and I am not paid to give them. The hamper has been sponsored for the benefit of my readers. My favourite potatoes are baby potatoes boiled until tender, then slightly crushed, drizzled with olive oil, sprinkled with sea salt and fresh rosemary, and then roasted. In the summer I love boiled new potatoes with some mayonnaise, in the winter I love creamy mashed potatoes. For lunch I love crisps in a floury blaa. Potato dauphinoise would be one of my favorite and not so difficult to prepare either. My mum grows her own potatoes and we all await patiently every year the new potatoe season. The smaller the better fried with garlic, served with salad. Heavenly! I do make a pretty good gratin dauphinois! After all this is where i am fron le Dauphiné. Such a clever idea for a lunchbox! I bet that would fill you 🙂 My favourite way of eating potatoes is probably the simplest….oven roasted with rosemary and a drizzle of olive oil. Simple Mash! Peeled, diced, boiled until tender. Drained, mashed, then add LOADS of real butter, sprinkle of sea salt and few grinds of black pepper. Then more butter 🙂 If I’m feeling wild I roast a bulb of garlic and squeeze the yummy juicy cloves in while mashing. Yum! I like small to medium potatoes simply steamed then peeled and served with a little sprinkle of salt and a glass of cold low fat milk. Very traditional and great taste. It’s hard to pick one way but in the summer I love to parboil baby spuds and then coat in rosemary, olive oil and salt and finish in the oven. Very Italian and very moreish. mashed with herbs & cream is the dream. but a chipper dinner? that’s the winner. Steam some fairly large spuds with skins on. Heat oven to as hot as it will go. Heat whatever oil you like Olive/Groundnut/Duck or Goose Fat on a large baking tray. Make sure oil is piping hot. Season oil with Maldon sea salt. Half your hot spuds lengthwise and place face down into hot oil. Brush the topside/skins with more oil. Place in oven for at least 30 mins or until crispy & golden/dark brown. Serve with dollops of homemade garlic mayo and chopped parsley (Delia Smith’s recipe is the best) or Natural Yoghurt & Chives. Make sure oven is piping hot…that’s why they go crispy. Alternatively BBQ spuds for a summertime feast. Lovely! We’re hoping to get in to see the tall ships too. The tractor must have been an added bonus. My favourite way of eating spuds is to dice them up, stick them in a roasting tray with olive oil, maldon sea salt, a few garlic cloves and some chopped rosemary. Then just wait for them to turn golden and crispy. Yum! I love to roast spuds and garlic and to throw some brie in to melt for the last 5 minutes of cooking time, arrange a lovely salad of lettuce, red onion , cucumber and cherry tomatoes and grated carrot. Mix everything up together with your favourite dressing – i usually go for olive oil, balsamic and a pinch of lemon or salsa dip. You can add anything you like, sometimes i add some sunflower/pumpkin seed and also some dried mango adds a bit of sweetness to it. So good! A lovely lunchbox idea there!! I really like baby new potatoes- I love to dice them up the morning after cooking and fry them with some garlic! I love to eat the roasties my mum makes on a sunday – she par boils them and then roasts in very hot oil and she has a magic touch with them – they are always crisp and very tasty. Gotta be mashed! I live when I’ve time to put the potatoes through a river to make them really smooth! Yum! Sometimes I’ll add a little cheese but always butter and warmed milk no matter what. Oh god obviously I meant I LOVE when I’ve time to use a RICER – stupid iPhone autocorrect! Well, the best spuds I know of is Roasties. Peel some Roosters and cut them into nice big chunks. Par boil them in some salted water just until the edges are beginning to break up. Drain and let dry for a minute or two. Throw in some Semolina flour and give them a light shake to cover. While all this is going on…pre-heat the oven as hot as you can get it placing a shallow try and some Goose Fat in there to warm up. Throw on the spuds and reduce the oven slightly…you dont want to burn the spuds. Turn every so often and they should be done in the oven after about 30-40 minutes. Lovely and crispy on the outside and when you cut into them a lovely spud awaits. Just add butter and some salt and it’s all good!! My favourite is potato gratin, made with loads of cream and loads of cheddar mmmmm…. The best way to eat spuds – steam / boil new potatoes until tender. Serve with Kerrygold real butter and a sprinkle of salt. I want some now. I love my spuds cooked anyway, as long as I get them every day.. whether boiled, mashed, roast, chipped or baked, spuds are great, SPUDS ARE GREAT! Oh love my potatoes boiled, then couple of glugs of olive oil & loads of chopped parsley & chives scatteres over them. My favourite is when you have cold leftover spuds from the previous night’s dinner. Slice them into rounds, sprinkle on salt and pepper and fry until crispy. Serve with beans and a fried egg for dipping – and a pot of tea.